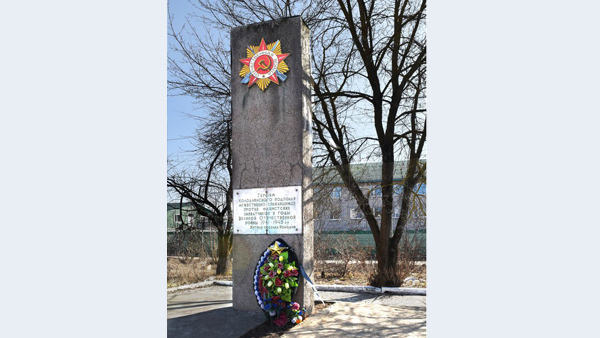 In July 1941, from the railroad workers of the Kolodnya station, which was located on the edge of Smolensk, and local Komsomols it was formed a small mopping-up detachment, which had to protect the railways, station buildings and other important objects from Nazi saboteurs. The commander of the detachment was appointed Lieutenant Grishin, the commissioner — N. Larikov. When the Nazis invaded to Smolensk, the railway volunteers fought with them, together with the regular soldiers of the 46th Division of the Red Army. The battle for the city continued for two weeks. In July 29 the Germans managed to seize Smolensk; there parts came to Kolodnya, and attacked the mopping-up detachment, occupied the checkpoint, located near the station, immediately. The forces were unequal, and soon the unit was almost completely destroyed, and the few survived fighters were forced to withdraw. Yet members of the clandestine continued to struggle with the hated invaders. The communists B. Chugunov and Y. Gugo controlled the actions of the Kolodnya organization. In August, the Patriots blew up a German ammunition dump and burned a railroad platform truck, wrecking the locomotive. But the Nazis did not doze: in August 26, they were captured and shoot more than thirty clandestine members, including the leaders of the organization. «Heroes of the Kolodnya clandestine, fought bravely against the Nazi invaders during the Great Patriotic War of 1941-1945. A memorial sign was unveil in September 1973 — to celebrate the 30th anniversary of Smolensk liberation from German occupation. Currently, this is a memorable place – a railway station Kolodnya — an object of cultural heritage (the monument of history and culture) of regional importance «Kolodnya Railway station, where from August 1941 to January 1942 operated a clandestine group».